Leasing a car? The lemon law may not protect you! If you lease a new car, you may not have the same lemon law protections you'd have if you bought it. 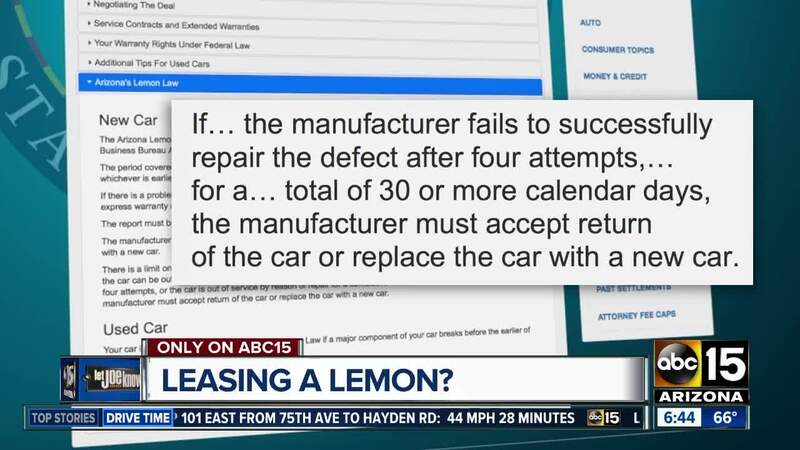 Generally, the lemon law protects against a new car defect if the manufacturer can't repair it after four attempts or the car is out of service for repairs 30 days or more. The car can then be returned or replaced. But Valley attorney Shalev Amar with the Amar Law Group points to a 2006 Arizona Supreme Court decision, saying the lessee does not "have remedies under the lemon law." Amar says when it comes to leases, "technically the leasing company owns the vehicle and is renting the vehicle to you the consumer. And because of that, the leasing company--they have lemon law rights as a consumer, but you don't." And in many cases, the leasing company is an arm of the manufacturer, who made the hypothetically defective car in the first place. Amar says before you lease, get the lender to sign something giving you protections. He says the agreement should have the vehicle, year, make, model and Vehicle Identification Number included. It should also list the financial institution and the consumer's name saying both are "bound by the Arizona Motor Vehicle Warranties Act." And then Amar says it must state "for the purposes of the Arizona Lemon Law the Lessee shall be deemed the consumer of the motor vehicle, with the Lessor having all the rights of a lien holder in such motor vehicle." All should sign it and have signatures notarized. You may get resistance but try to get those rights included in the contract or no deal. That way, if there is an issue, you have the option to push for a buyback if it makes financial sense. Click here for more on your lemon law rights.